Hello! It’s been a month since I was in Leeds, I thought it was about time to look back and reflect on what was an incredibly jam-packed week in Leeds. I went up on the Tuesday morning for the pre-conference workshop. This was the first time I had hosted a workshop and was rather nervous as to what to expect. What if no one comes? What if the material I pitched is too easy/hard? What if they are BORED of the topic? What should I do if there are different levels of ability within the group? Pushing these thoughts aside, I donned my plastic name badge with a smile and got stuck in. Before the workshop, I did a bit of homework to find out where my attendees were coming from. 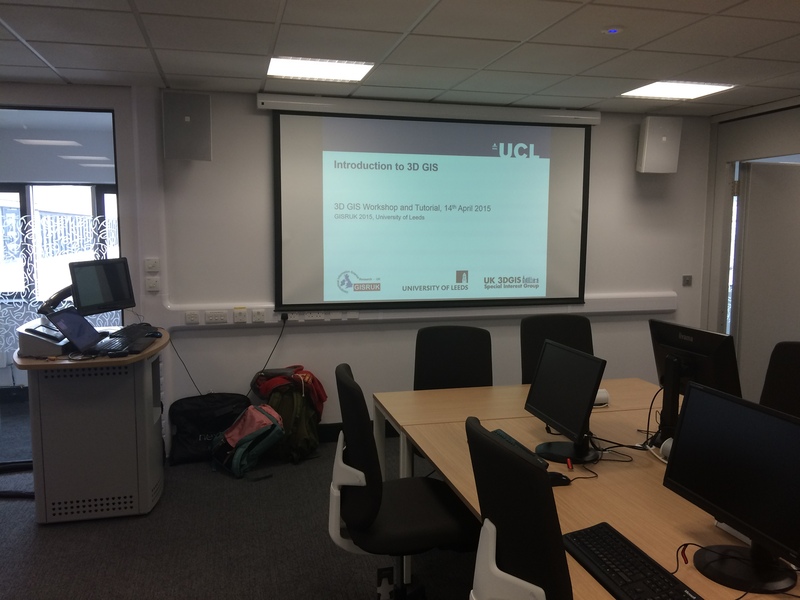 Of the 13 people that had turned up, a large majority were Masters level students who were interested in 3D and knew very little about it and others were from industry or academia who wanted to know a bit more about 3D. I was incredibly pleased that they had decided to come and learn a little about what I do! I decided to keep the materials quite light, practicals short and rewarding and provide plenty of opportunities to ask questions and discuss their thoughts. For me, nothing is worse than a pre-conference workshop that is incredibly heavy and pitched as too high of a level – resulting in you being exhausted before the real conference has even begun! On the first half day I began by giving them an introduction to 3D GIS before delving into ArcScene & Google Earth to get some real hands on experience with 3D data. The second day focused on more of the emerging technologies such as Web 3D. The attendees had a great time with QGIS and the Three.js plugin with many gasps of delight echoing the room – brilliant! Overall, very pleased with how the workshop went. I would perhaps include more “extension exercises” during the practical for the quicker ones next time. They all left with a bit more knowledge of 3D which is all I had wanted.